mild, fragrant rice dish made with coconut milk and mixed veggies. 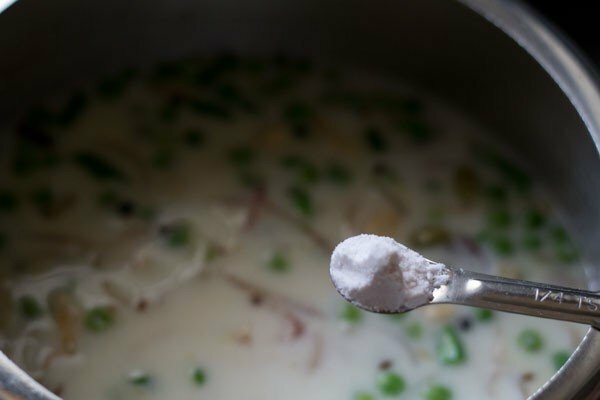 coconut milk rice recipe with video and step by step photos – fragrant, tasty and mild pulao made with mixed veggies and coconut milk. 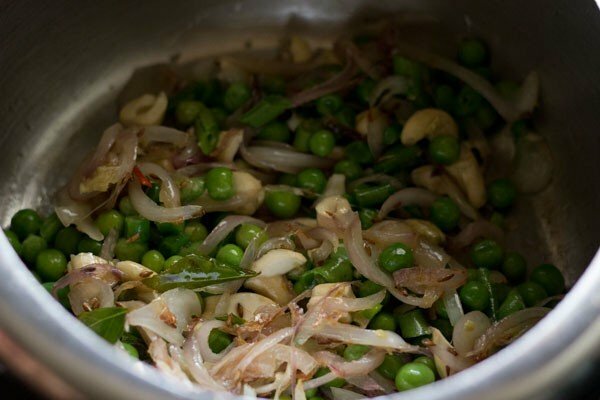 i often make pulaos and rice based dishes since they are quick and easy to prepare. 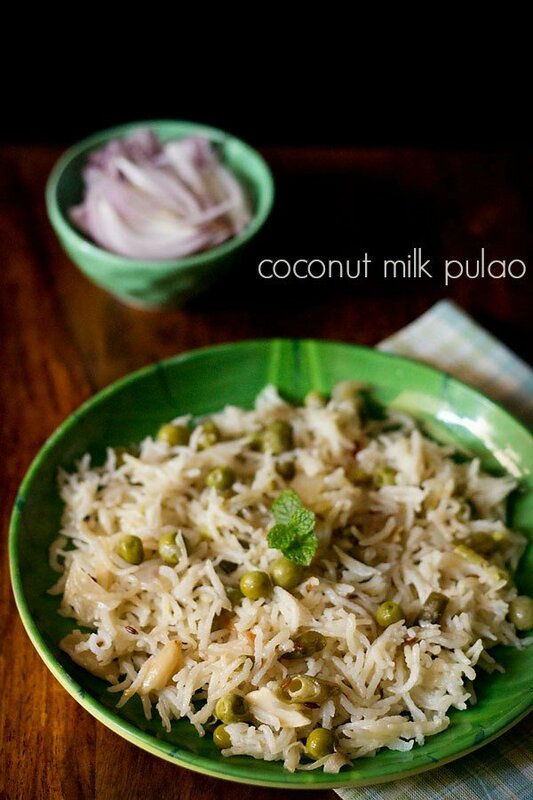 the difference between this pulao and other pulaos i have posted, is the addition of coconut milk. coconut milk is the highlight in this recipe. 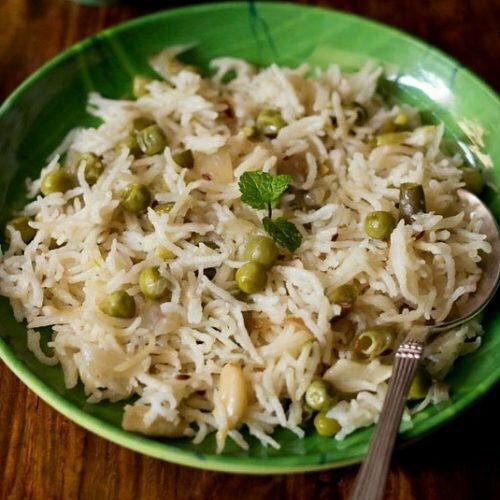 another delicious pulao variety which is made with coconut milk is this brinji rice recipe from tamil nadu cuisine. the coconut aroma and flavor along with the fragrant spices does make this pulao different from the regular pulaos. so when you want to add some richness and flavor to your food, add coconut milk. i did add some veggies to the pulao, but feel free to omit the veggies. or you can add veggies of your choice. 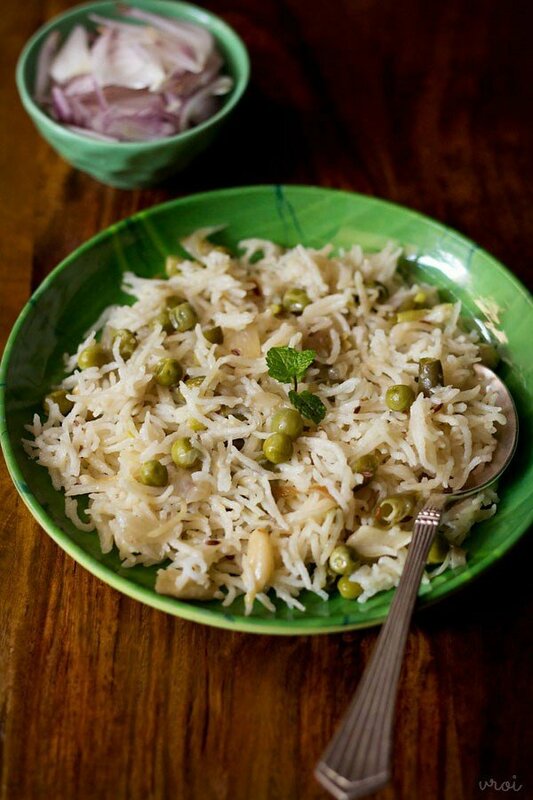 serve the coconut milk rice with some side veggie salad or raita or even a side biryani shorba gravy. this coconut rice also pairs well with dal fry or dal takda. 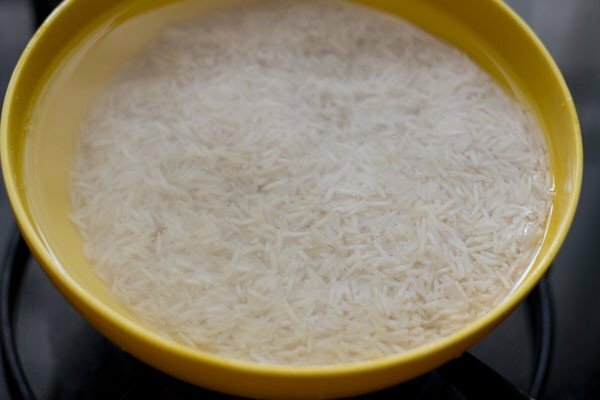 rinse basmati rice very well in water till the water runs clear of the starch. soak the rice in enough water for 20 minutes. after 20 minutes, drain the rice and keep aside. when the rice is soaking, prep up the veggies by chopping them. slice the onions thinly. also crush 1/2 inch ginger + 2 to 3 garlic + 1 green chili in a mortar-pestle. 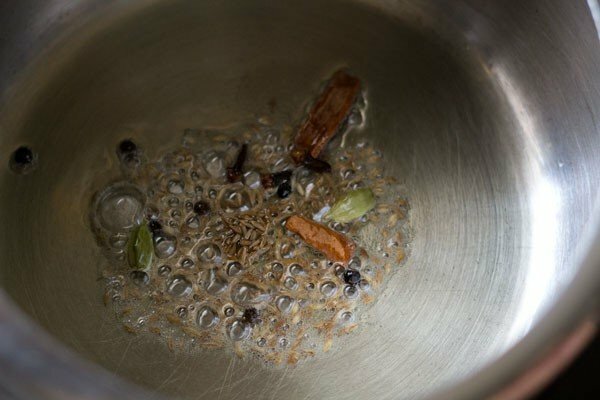 heat 2 tbsp oil in a pressure cooker and add the whole spices - 3 to 4 cloves, 3 to 4 green cardamoms, 1 inch cinnamon, 1 single strand of mace and 1/2 tsp cumin seeds. saute the spices till they splutter and become fragrant. 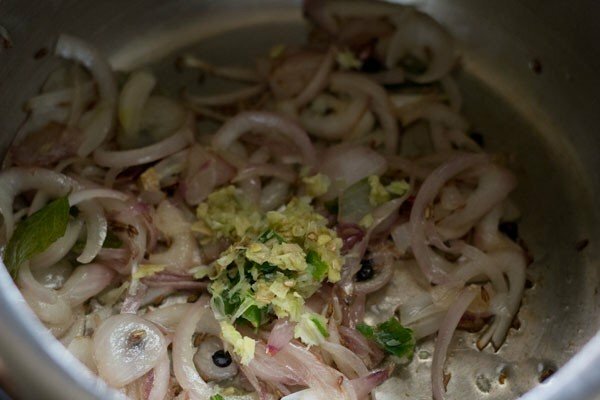 now add 1 cup thinly sliced onions and 5 to 6 curry leaves. 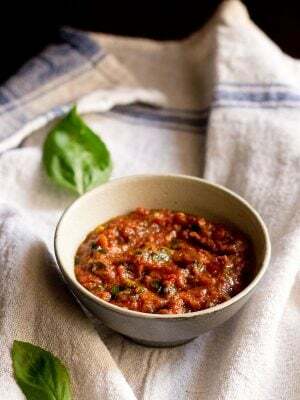 if you do not have curry leaves, then add 1 medium sized tej patta/indian bay leaf when you saute the whole spices. stir very well. saute till the onions turn translucent or a light golden. then add the crushed ginger+garlic+green chilies paste. stir and saute till the raw aroma of ginger and garlic goes away. now add 10 to 12 cashews, which have been chopped. cashews are optional and you can skip them. stir again. now add the mixed veggies. you can add 3/4 cup of any mixed veggies. i added 1/2 cup green peas and 1/3 cup chopped french beans. stir and saute the veggies for a minute. then add the rice grains. gently mix and stir the rice grains with the rest of the ingredients. now pour 3/4 cup thick coconut milk. you can also add 1 cup thick coconut milk. add 1 to 1.25 cups water. stir well. if using 1 cup coconut milk, then add 0.75 to 1 cup water. then season with salt. taste the stock and it should feel slightly salty. cover and pressure cook coconut milk rice for 1 to 2 whistles or for 8 to 9 minutes. i pressure cooked for 2 whistles. when the pressure settles down naturally, open the lid and gently fluff the rice. garnish with some chopped coriander or mint leaves. serve coconut milk rice with a side dish of raita, biryani shorba gravy or some pickle and salad. 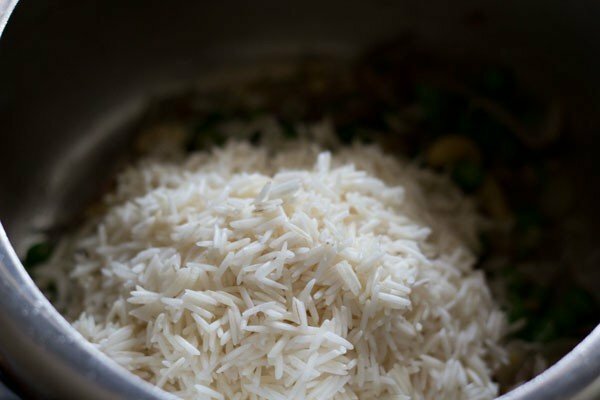 1. rinse basmati rice very well in water till the water runs clear of the starch. soak the rice in enough water for 20 minutes. after 20 minutes, drain the rice and keep aside. 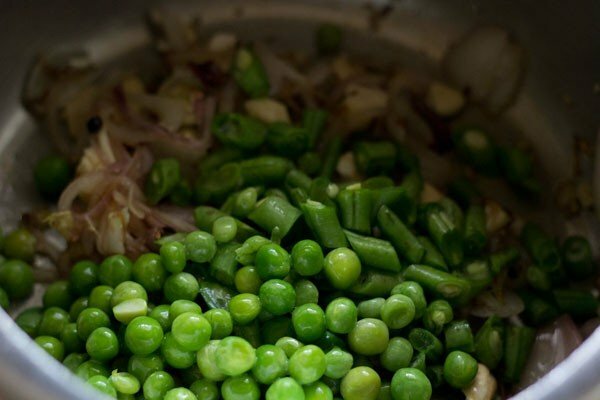 2. when the rice is soaking, prep up the veggies by chopping them. slice the onion. 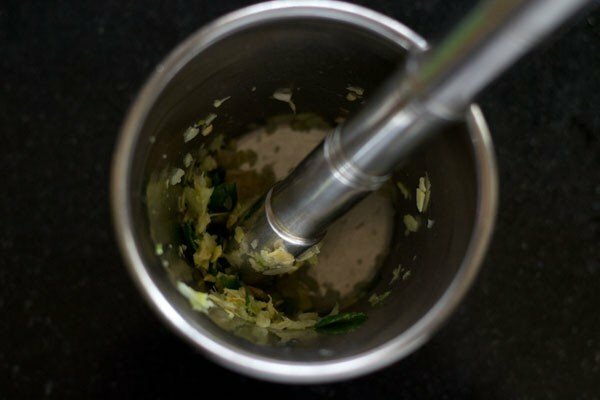 also crush ½ inch ginger + 2 to 3 garlic cloves + 1 green chili in a mortar-pestle. 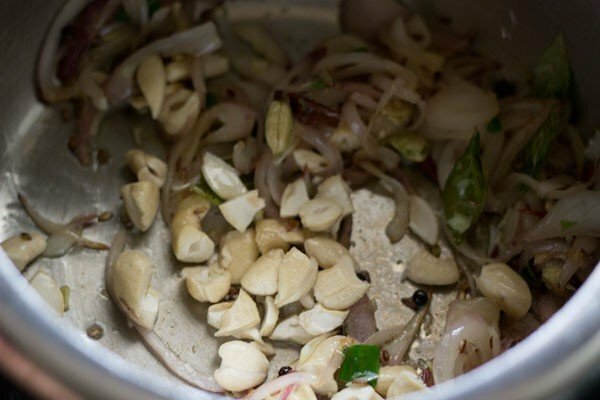 3. heat 2 tbsp oil in a pressure cooker and add the whole spices – 3 to 4 cloves, 3 to 4 green cardamoms, 1 inch cinnamon, 1 single strand of mace and ½ tsp cumin seeds. saute the spices till they splutter and become fragrant. 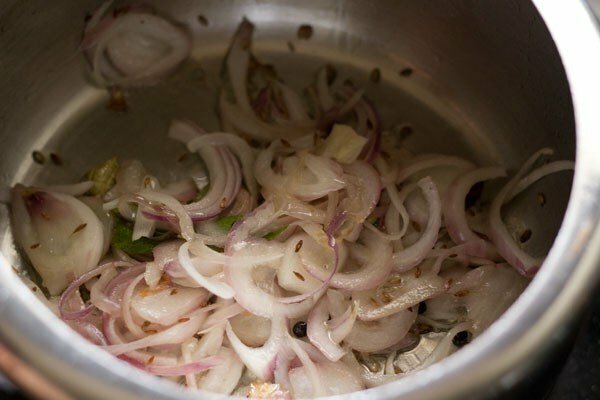 4. now add 1 cup thinly sliced onions and 5 to 6 curry leaves. 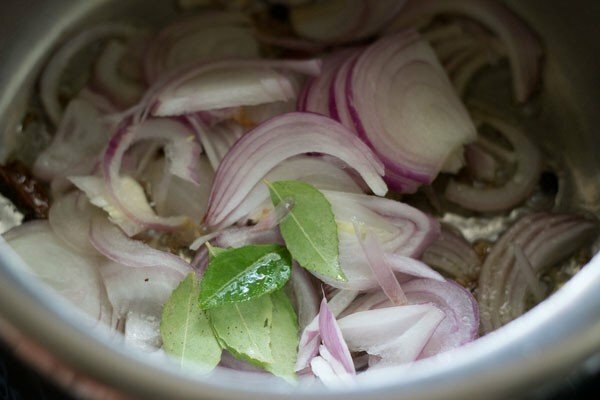 if you do not have curry leaves, then add 1 medium sized tej patta/indian bay leaf when you saute the whole spices in step 3 above. 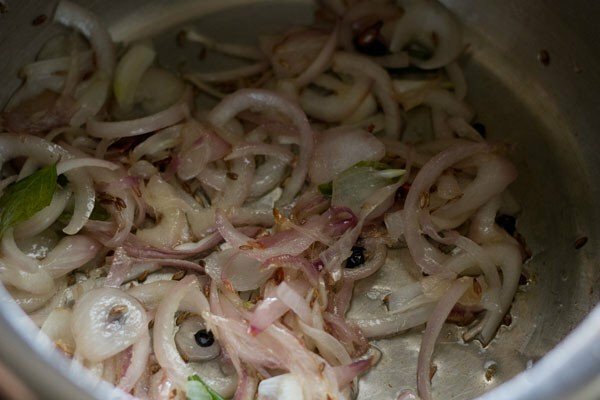 6. saute till the onions turn translucent or a light golden. 7. then add the crushed ginger+garlic+green chilies paste. stir and saute till the raw aroma of ginger and garlic goes away. 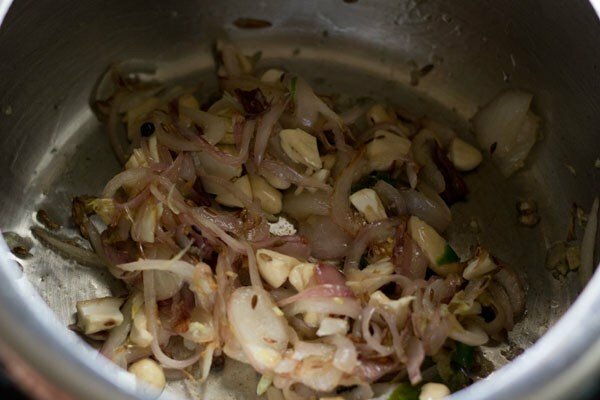 8. now add 10 to 12 cashews, which have been chopped. cashews are optional and you can skip them. 10. now add the mixed veggies. you can add ¾ cup of any mixed veggies. 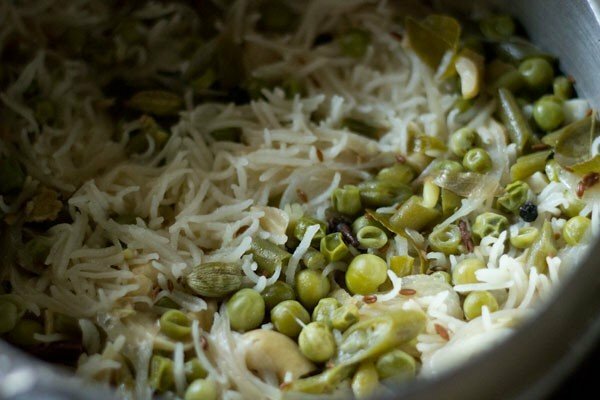 i added ½ cup green peas and ⅓ cup chopped french beans. 11. stir and saute the veggies for a minute. 12. then add the rice grains. 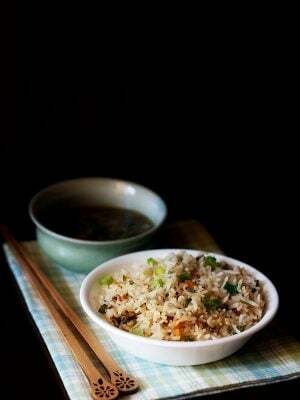 13. gently mix and stir the rice grains with the rest of the ingredients. 14. now pour ¾ cup thick coconut milk. you can also add 1 cup thick coconut milk. 15. add 1 to 1.25 cups water. if using 1 cup coconut milk, then add 0.75 to 1 cup water. 16. stir well. then season with salt. taste the stock and it should feel slightly salty. cover and pressure cook coconut milk pulao for 1 to 2 whistles or for 8 to 9 minutes. i pressure cooked the pulao for 2 whistles. 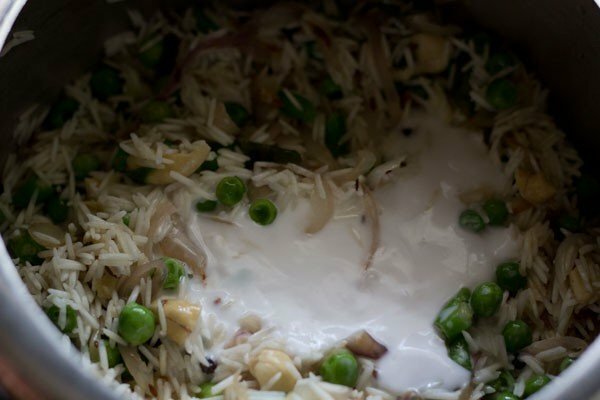 17. when the pressure settles down naturally, open the lid and gently fluff the coconut milk rice. 18. garnish with some chopped coriander or mint leaves. 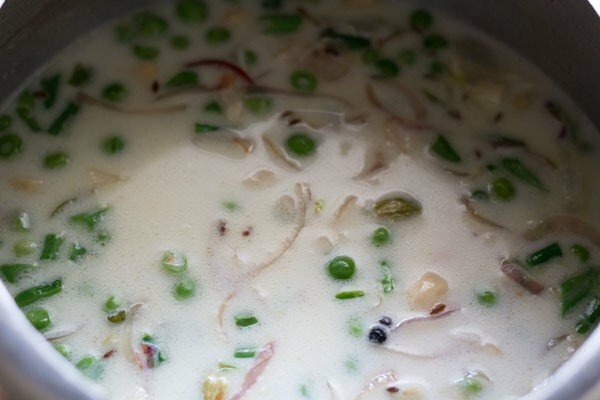 serve coconut milk rice with a side dish of raita, biryani shorba gravy or some pickle and salad. This recipe works really well in a normal pot. 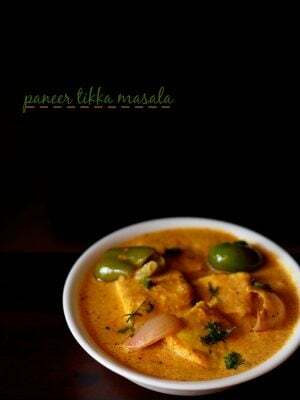 It is so rich in taste and wonderfully creamy from the coconut milk. I cooked it late night and can’t stop eating it 🙂 Definitely a 5-star recipe!!! thanks thomas. glad the coconut milk rice recipe worked in a pot. thanks for sharing. Hi, I tried the coconut milk biryani with cauliflower on the whileit turned out well. Just wondering, when you say cook on pressure,what does that mean in terms of gas mark? Full heat or on low setting? thanks. on a medium mark. not full heat or low setting but kind of between. Hai.. 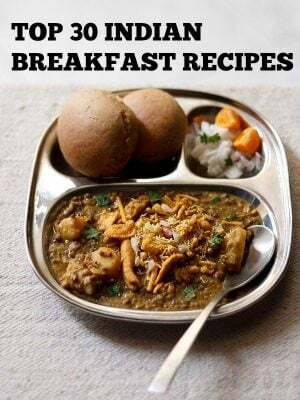 I don’t know in which recipe I need to comment.. coz which ever recipe I tried from ur blog it was a big hit.. perfect the taste was jus awesome.. way to go.. very happy that I found Ur website to learn cooking.. Thanks Harene for this awesome feedback. I am glad to read your comment. dassana you are a blessing to me !! the pulao turned out amazing..
all the compliments which i received for the dish belongs to you. thanks for being there ..
welcome aishwarya. thanks for this sweet feedback. 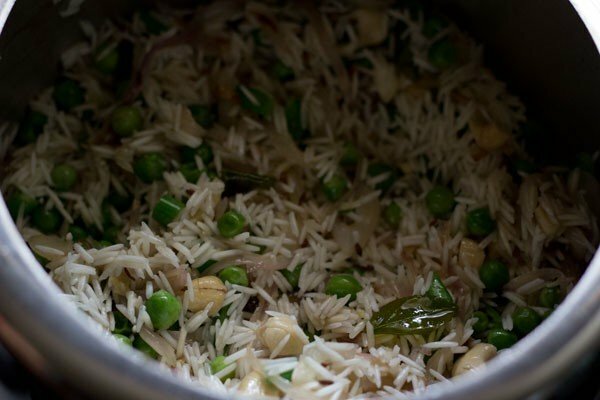 I tried this pulao and it turned out great. Thank you for sharing this recipe. I am a follower of your blog and all of your recipes are awesome. Welcome Sarita. Thanks for your kind words and positive feedback. 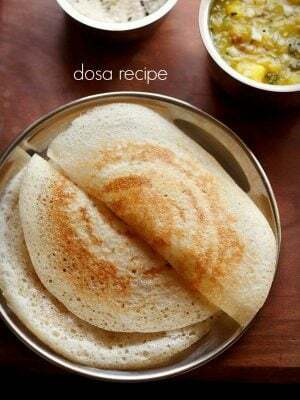 I tried this recipe for lunch..it was super and tasty…. thanks karthika for your positive feedback. 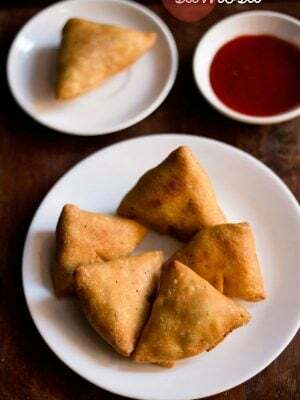 this recipe so amazing i will trying this recipe tommorrow . surely try this shazia 🙂 and let us know how it was? thank you. you know what this website is really super. i have learned cooking from sratch too v.good from this. kindly include non veg items also if possible. its just amazin. pleased to know this sneha and thank you for your positive words. 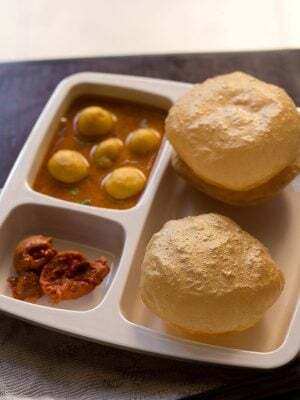 we are vegetarians hence we will not share any non vegetarian posts but if you have a request for any vegetarian recipe do let us know. Hi . Usually i use 1 1/2 cup of water for 1 cup of basmati rice. If I am using coconut milk should I add 1 cup coconut milk and 1/2 cup water for 1 cup rice?? Should this coconut rice have strong flavour of coconut?? you can add 1 cup coconut milk and 1/2 cup of water. the coconut rice does not have a strong flavor of coconut, but the presence of coconut is felt. 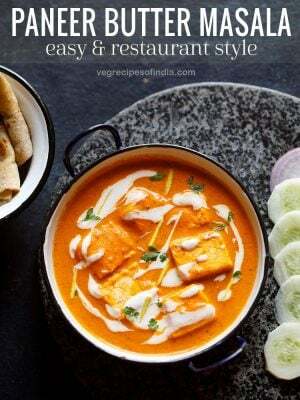 Do you have any other website for non vegetarian recipes? thanks a lot sudheera for this positive feedback. we do not have any website for non vegetarian recipes. Hi dassana! This looks yummy. Can you please tell more about coconut milk. Is it the one that we get in tetra pack that we can use or if we want to use home made coconut milk then how to make it. Kindly advise.